Aral sea in the basin of the Kyzylkum Desert, Kazakhstan, which was once the fourth largest lake in the world, has almost completely dried up, as revealed by recently released NASA images. Aral sea, which was once the size of Ireland, has been almost completely wiped off this planet. The side-by-side images of Central Asia’s Aral Sea in 2000 and 2014 are striking. The beginning of the disaster can be traced back to the early sixties when a massive Soviet Union irrigation project diverted water from the rivers that fed the lake into farmland. Water from Kazakhstan, Uzbekisan and Turkmenistan was diverted, with the result that the lake started shrinking. Sadly enough the ambitious Soviet project – a diversion of the two rivers that fed into the Aral Sea – was only a short-term success. The engineers decided that the Amu Darya and Syr Darya rivers would irrigate the desert, where cotton could be grown for future exports – but the implementation of the idea led to an ecological catastrophe. The nearly dried up lake now has turned into a desert. It is now home to camels and abandoned ships decorated with graffiti depicting the ghosts of sailors. In this picture released by Reuters, Children can be seen running past ruined ships abandoned in sand that once formed the bed of the Aral Sea near the village of Zhalanash, in southwestern Kazakhstan. In 2010, a documentary depicted the dramatic desiccation of the Aral Sea, which has now become a byword for ecological calamity. At that time the lake still covered half of its original area of 25,500 square miles, while the volume of water had been reduced to a quarter, according to the We Are Water Foundation. Spanish director Isabel Coixet made the film for the foundation, which seeks “to enable the equitable development and sustainable management of the world’s water resources.” At the time the foundation said: “The region has the highest infant mortality rate in all of the former USSR” and “chronic bronchitis has increased by 3,000 per cent and arthritis 6,000 per cent, and in part of Uzbekistan” liver cancer has increased 200 per cent. 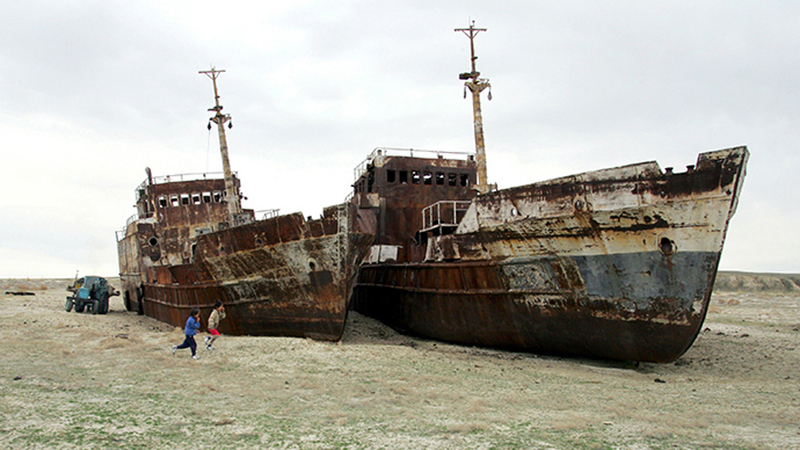 The Aral Sea’s demise also puts the health of people living on its shores at risk. “You can’t see salt in the air, but you feel it on the skin, and you can feel it on a tongue,” said a local woman, whose husband suffers from chronic bronchitis. But the salt isn’t the only threat; the wind also spreads dangerous pesticides.